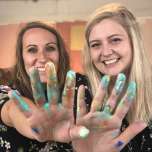 Lauren & Caylee created Get Messy to help themselves grow as artists, find their creative style, connect with other makers and create consistently. Before long the word was out and everyone wanted in. 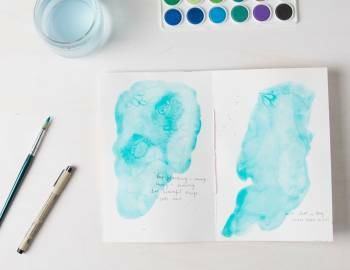 Get Messy is now full of creators from all over the world who connect to nurture their creativity, become the artist they desire to be and find their creative community. 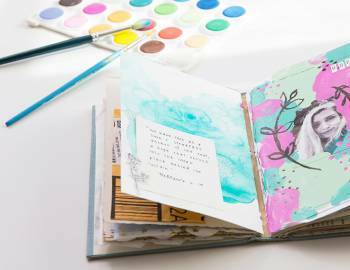 Get Messy offers over 500+ art journal tutorials, prompts, artists interviews and inspiration to get you making, plus a thriving and present tribe of artists who love to make, share and connect. Lauren is an American who lives in the UAE with her husband. Lauren is an Art Maker, Grace Giver, Photographer of Life, Laugh Enthusiast, Creativity Chaser, Believer in People, Adventure Seeker, Inspiration Aficionado, Street Food Lover, and DIY Fanatic. She hosts the podcast How She Creates and blogs at Lauren-Likes.com. Caylee is a South African living in Germany with her husband, human baby and fur baby. Caylee is a Fairy Artmother, Jedi Master, Art Minimalist, Overenthusiastic, Forest Wanderer, Coding Wizard, Habit Keeper, Chairman of the Pants by Choice Club, and Colour Muter. 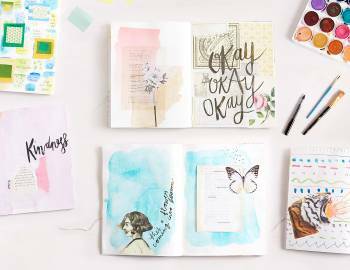 Caylee helps creatives be their most productive artist selves over at CayleeGrey.com.